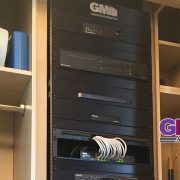 One of the main points of pride here at GMI and with the #DoneRightNotEasy crew is our knowledge, experience, and command of not just Crestron control systems, but almost every other system the automation experience touches. What many may not realize is that the most important of these systems, and the one we have the deepest knowledge well in which to draw, is the monitored security and protection of a home or commercial space. This knowledge and understanding of how security and automation work together is just one of the many ways we bring more value to our customers than your typical integration professional. 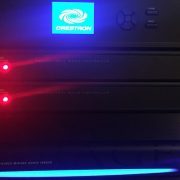 While other integrators or Crestron engineers may simply add an aftermarket security and monitoring solution on top of the automation system, or worse, leave the newly automated property unprotected, we take the time to fully integrate the security aspects of your home into the automation system itself. What would have traditionally been banal alarm routines, such as arming or disarming your security system, can now be used to trigger any number of automation scenes. Motion and occupancy sensors can also be used to automatically turn off or on lights or entertainment options depending on who is coming and going. In the event of an attempted break in or other alarm event, the security integrations with the Crestron system bring the protection of your home to the next level. If an alarm is triggered when you are at home, a path can be lit directly from whatever room you are in to the nearest Crestron panel, allowing you to view surveillance cameras pointed directly at the site of the event. This can allow you to ascertain if there is a burglary in progress, or simply a teen or college student returning past curfew. This ability can even be accessed directly from your smartphone or tablet. Security in commercial spaces such as luxury or high rise office spaces tends to center more on access control and surveillance than a traditional monitored alarm. Biometric or card based access control systems are integrated directly with Crestron control to provide instant identification of who is coming and going from a space. For further security, each card or bio reading can be specifically tailored to access certain parts of the building, meaning that you can secure sensitive areas from overnight cleaning crews or low end associates. Surveillance cameras and intercoms can also be tied directly into video walls or desk based panels to provide access to guests or clients without interfering with valuable work time. 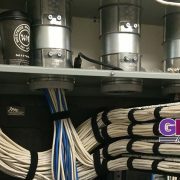 GMI and the #DoneRightNotEasy crew strive everyday to gain more and more knowledge about the unique ways Crestron automation systems interact with every part of the home or office. Security and protection of these spaces is top priority for many of our clients which makes it paramount for us as well. Interested in learning more about how GMI can secure and automate your home or office? Contact us today!